Jersey Girl's brother, Jersey Boy, was in town for a visit, and she suggested meeting for dinner on the rooftop terrace restaurant of Hotel U Prince. 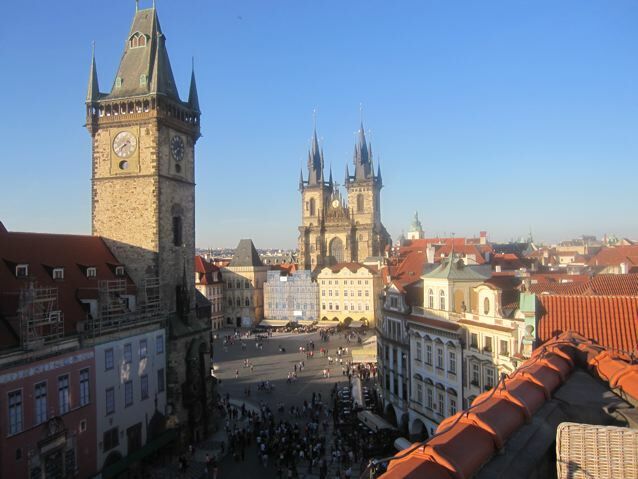 I was wary because of its tourist trail location above Old Town Square. I would have nixed the idea, but I recall reading one comment on Tripadvisor, a site I use a lot, that the food was decent. But that was a long time ago. If I'd really done my homework, I would have read the dedicated restaurant review page. 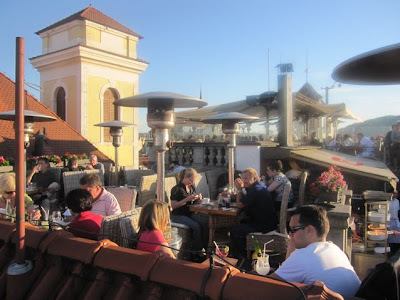 On this warm, beautiful spring evening, the terrace was packed with tourists who were eating, drinking and snapping away with their cameras. I got there first and, with good timing, scored one of the best tables. It was on the corner of the roof, overlooking the square, the Týn Church, and the crowds gathered in front of the Astrological Clock. While I waited for the Jerseys, I looked through the cocktail menu and then ordered a mojito. They had small version for 139 CZK. But I decided to go for the large (199 CZK). It was large, indeed, and strong. 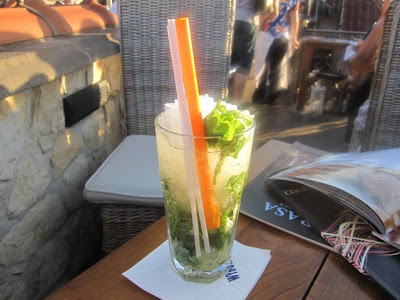 It was well-mixed, with wide-bore straw for sucking up the minty-limey goodness. Though it was over-packed with ice, I was more than happy with my drink, the view, and the weather as I waited. In due course, the tardy couple arrived and was also pleased with our prime location table. Then, waiter brought bread -- some dull, dry rolls. We ordered from the big, picture book menu. The photos certainly looked nice. 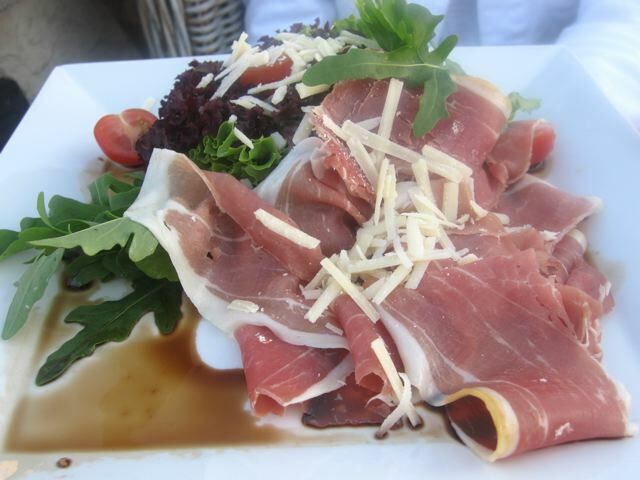 Jersey Girl had the large Parma ham salad (349 CZK). She said the lettuce was boring and the ham was not very good. I thought there should have been more leaves considering this was a large salad for a large price. But I disagreed about the ham and thought it was fine. I got the small plate of tagliatelle with spinach, Parma ham, and shiitake mushrooms (199 CZK). It was small, indeed. Perhaps that was a blessing. It was terrible. After the pasta was overcooked, but before it was allowed to dry out, it had been soaked in balsamic vinegar. This turned it brown and gave it a sickly sweet tang. I could find no sign of spinach in there. By looking extremely carefully, I detected a few, meager flecks of ham. 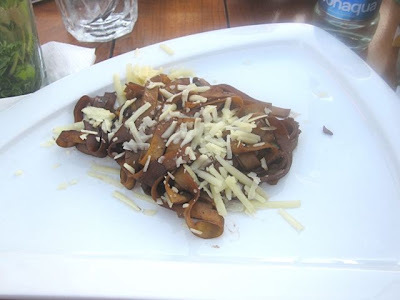 The tired tagliatelle didn't look nearly as appetizing as the picture on page 23 of the menu. For drinks, Jersey Girl had a .25 liter bottle of Bonaqua for a rather astounding 59 CZK, along with a glass of red wine (148 CZK). Later, she got a large mojito. Jersey Boy had a Jameson (99 CZK). 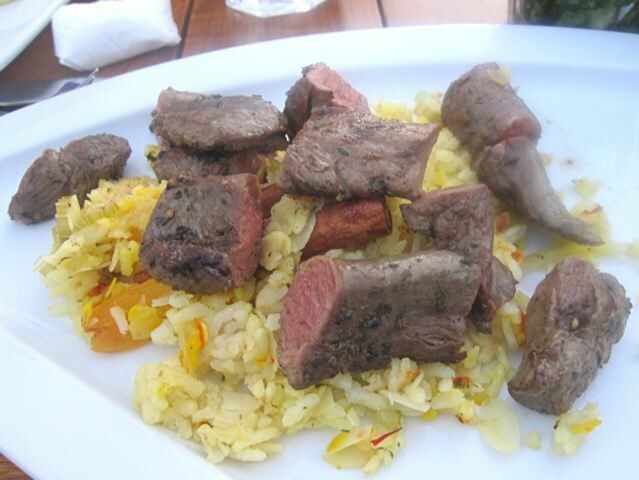 For my main course, I had the grilled, spicy lamb loin with risotto and apricots (599 CZK). The tenderloin could have been great, but there was a failure in the preparation of this fine meat. Some pieces were medium rare, as I like, while others were cooked through. I didn't detect any spice, and it didn't taste grilled. Most importantly, it would have been much better if it was served hot instead of barely warm. The so-called "risotto" was a disaster. 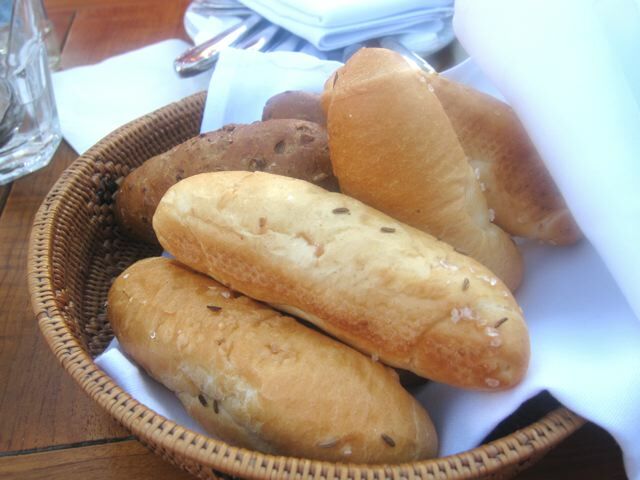 It was crunchy and also dry as a desert. I feared it would blow away in a light breeze. Or perhaps I mean it was like a dessert. The cinnamon stick in there didn't work for me. 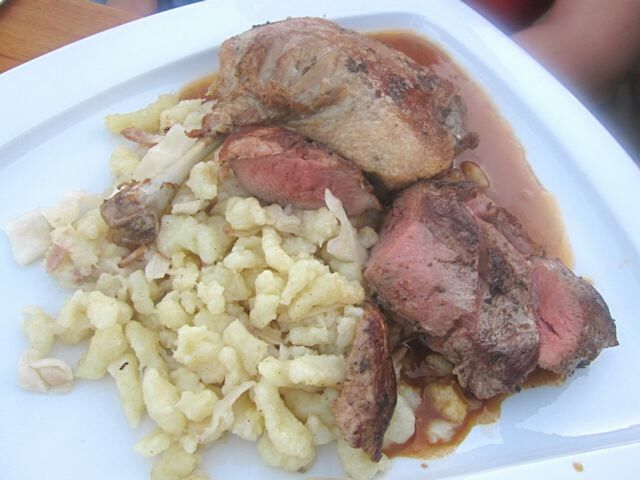 Jersey Boy had the grilled duck breast and baked thigh with gnocchi and sweet white cabbage (399 CZK). He didn't like it at all. The breast was relatively flavorless. One bite of the soggy, mushy thigh and he decided he didn't want any more. Even the sauce was bland. The gnocchi was rubbery and lifeless and had very little cabbage to perk it up. He ate less than half of this expensive dish. He was shocked that he could get such a bad duck dish in Prague. 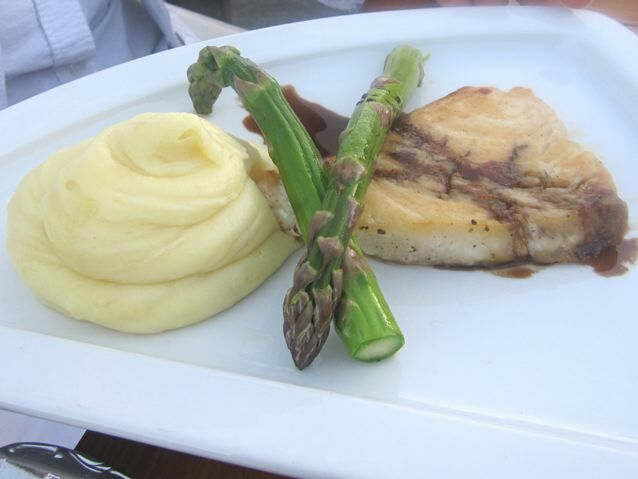 Jersey Girl had the spicy butterfish with asparagus and truffle emulsion, served with a potato puree (349 CZK). You might say I saved the worst for last. This was dismal. It was overcooked, dried out, and tasted fishy and old. There was a desultory splash of balsamic across the middle of the fish that did nothing to mask its wretchedness. She barely ate a quarter of it. When the waitress took the dishes away, she cheerfully turned to Jersey Girl, ignoring the uneaten food on her plate. "Did you enjoy your dinner?" "Oh." The waitress seemed surprised and retreated. I must add that the fresh asparagus was very good, and we both liked the creamy potatoes. But that hardly makes up for the repellent main attraction. 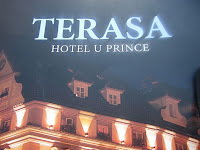 When you walk up to the terrace at Hotel U Prince, you pass by an open kitchen with chefs dressed in white, busily preparing meals. 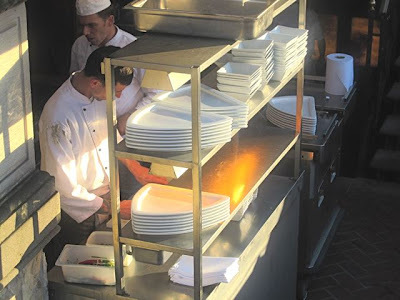 I now think they should be arrested for impersonating food service professionals. They should be ashamed of the fancy-sounding, over-priced, poorly executed dishes they serve. If you think my assessment is rough, go back to the link above and check out the verbal violence in some of the Tripadvisor reviews. Comments range from "worst service experienced ever" to "avoid this restaurant - disappointing and overpriced" to "extremely disappointing." Of course, these were mixed with some like "gastronomical delight at the Astronomical Clock." But it appears that more negative reviews than positive have been posted in recent months. So, what's the point of this exercise? 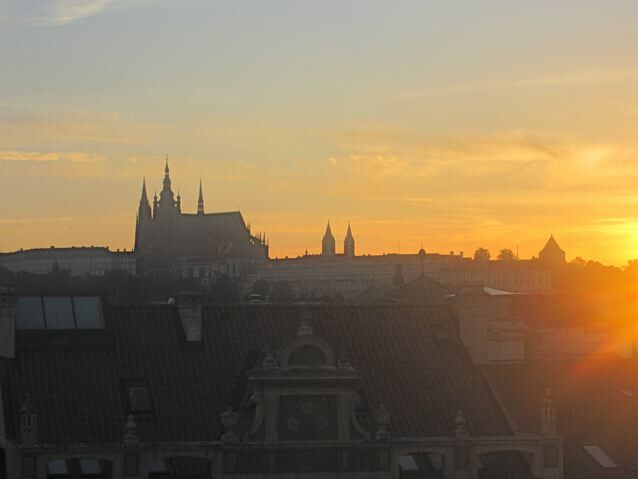 Most people living in Prague already know to steer clear of just about anything on the tourist trail. Then again, there will always be some, like me, who go against their instincts and make a mistake. 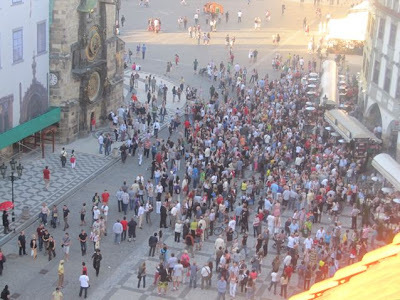 And, of course, there are the many tourists who might more easily succumb to the lures of a pretty perch above Old Town Square. So if I can save at least some of the people from being fooled, I thought it worth while to shout it from a rooftop. Surely you didn't expect any more / less? I remember watching on Czech TV about 15 years ago a local reporter posing as a German tourist in the beergarden down below. He was shaken down quite literally for 2,000 kcs for his beer in broad daylight, caught on hidden camera. Nothing to do with this hotel, I hastily add. Such excesses seem to have been clamped down on these days, thank goodness, but the thought's still there I see (59 kcs for 25cl BonAqua??? ; it's filtered TAP WATER people, even Coca Cola admit this). Actually, I think she asked if everything was OK automatically, and didn't actually look at our plates. So she was all the more shocked when she got an emphatic "No!" I only go there when I have visitors in the summer. We literally have one over-priced beer and admire the view before leaving to eat elsewhere. I'm trying to remember if I have ever seen anyone eating there, but I don't think I have. 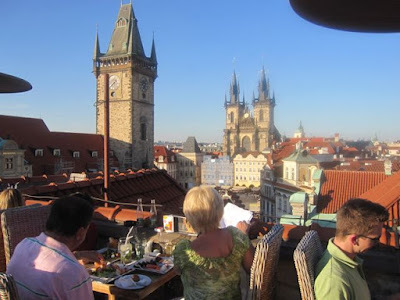 It is obviously very expensive - presumably their overheads are higher - but as your photos show, the view is quite spectacular and, if you stick to a quick beer, well worth it.